Erik Hughes’ scientific background is in Chemistry and Biochemistry, achieving a 1st Dual honours BSc at Keele University in 2012. He secured a position as a Research Formulation Engineer shortly after graduation, working towards an Engineering Doctorate (EngD) qualification based between the University of Birmingham and industrial sponsors TWI Ltd. Erik’s research interests are broad, working extensively with a number of industrially relevant materials, including polymers, ceramics and composites. His expertise in chemistry, experience with a variety of materials and proficiency with a number of analysis methods (e.g. FTIR, raman spectroscopy, XRD, µ-XRF, SEM) makes him an accomplished materials chemist, where he has successfully formulated, developed and added value to a number of raw materials and products. 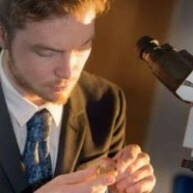 In his current role as a Research Fellow Erik is based between the University of Birmingham and the Surgical Reconstruction and Microbiology Research Centre (SRMRC) developing materials for hard tissue reconstruction. He is currently working closely with calcium phosphate and calcium pyrophosphate bioceramics, furthering understanding of the osteogenic potential of these materials as well as developing novel delivery systems that may be utilised in the clinical setting. This position utilises Erik’s skills as a chemist and materials researcher with industrial experience, whilst allowing him to develop his skillset in terms of biological analysis and acquiring funding for research projects.